In the world of expanding globalization, various cross-border problems are arising. For example, such problems as the environment, energy, natural disasters, and infectious diseases cannot be tackled by a single country alone. To overcome these problems and maintain sustainable development, international cooperation is now a worldwide demand. Moreover, the advance of science and technology around the world is spectacular. Amid the intense competition, in order for Japan to sustain and develop a world-class science and technology capability, it is even more important than before for the government to play its role in supporting the international expansion of science and technology in a strategic manner. Indeed, the government's 4th Science and Technology Basic Plan calls for strategic expansion of international activities integrated with the world. Global expansion including these cooperation and competition is extremely important in the area of science and technology. In response to this policy demand from the government, Japan Science and Technology Agency (JST) has been implementing the Strategic International Research Cooperative Program (SICP) since 2003. 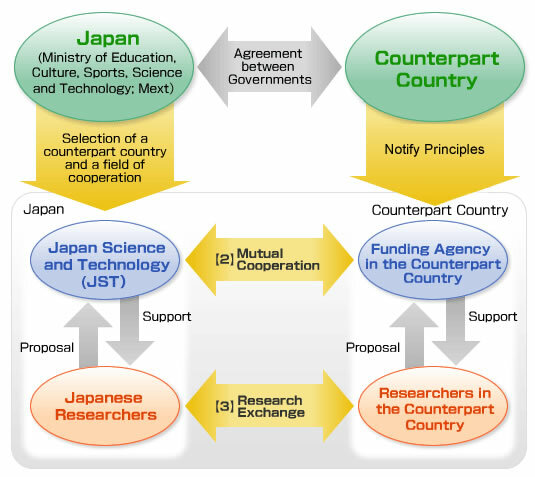 This is a "top-down type" of program that provides support to international research projects with countries and areas and in fields of cooperation designated by the Ministry of Education, Culture, Sports, Science and Technology (MEXT) on the basis of intergovernmental agreements, agreements at ministerial-level meetings, and so forth. JST has already started its cooperation with countries in Europe, America, Oceania, Asia, Middle East and Africa under this program. Aiming at further development of science and technology, JST is enhancing active international research collaborations through solid partnerships with counterpart countries. This research fund can be used for expenses relating to (a) research meetings by project researchers; (b) joint research activities; (c) dispatch and invitation of researchers; etc. These workshops consist mainly of lectures by researchers from Japan and counterpart countries. The principal objective is to facilitate exchange activities among participating　researchers. A financial support is provided as necessary for holding training courses, etc. The program is implemented by organically combining the above-mentioned assistance according to the needs of counterpart countries and cooperative fields. The basis of the program is that JST assists researchers on Japanese side and funding agencies in counterpart countries assist researchers in their countries.